At the heart of the whole Movember Movement is the desire to raise funds to be able to contribute to valid and life changing health projects. The chance to have a wider conversation about the need to stop men from dying too young by getting regular checkups. These are all very achievable things. 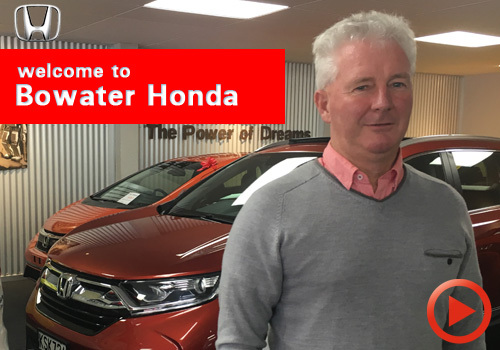 We caught up with Nick D'Evereux the General Manager of Bowater Honda to chat about all of this. There is a real nice moment in this video so please watch it! The whole purpose of Movember Foundation New Zealand is to raise awareness and funds for men's health to go some way in preventing men from dying too young. That is why we do it at Bowaters. It's not all about the moustaches. 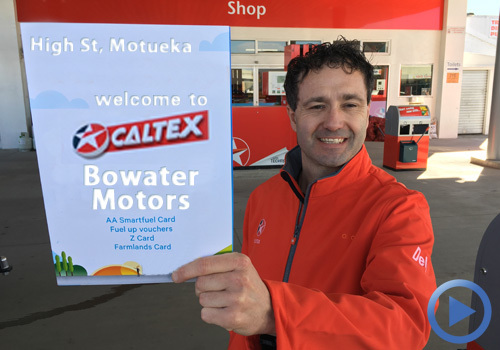 Nick from Bowater Honda empties his wallet and fills his heart! A better tomorrow starts today. 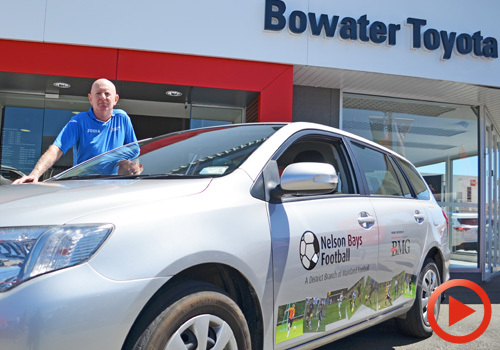 Bowater Toyota walks the talk. 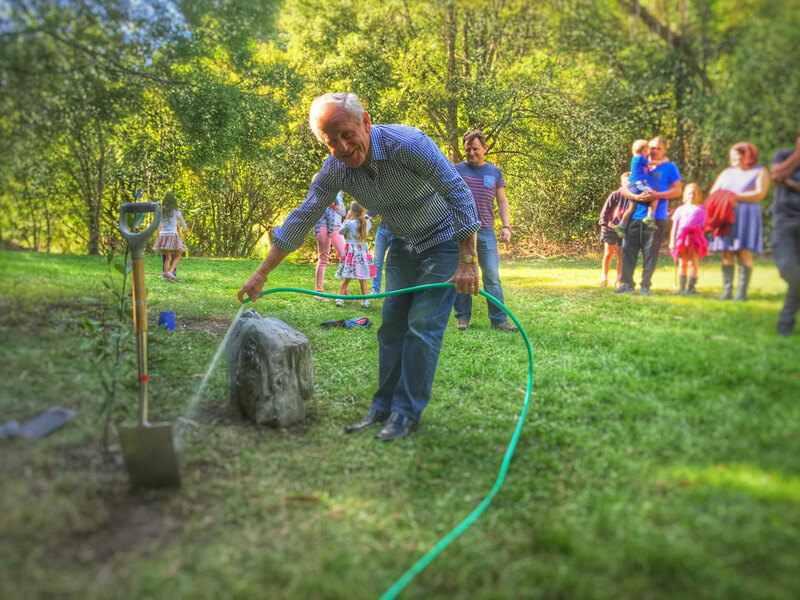 Rodney Bowater, chairman of the Bowater Motor Group, watering in the tree commemorating our relationship with the Brook Sanctuary. Click to enlarge. 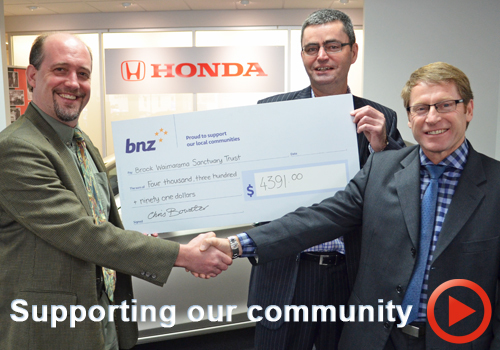 Bowater Toyota, and the wider Bowater Motor Group, are very excited that the Brook Waimarama Sanctuary's "Get Behind the Fence" campaign is coming to fruition with the 14 kilometre fence almost completed. 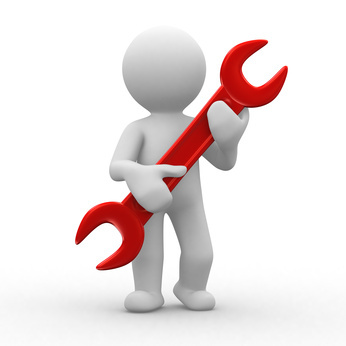 We have been keen supporters of the whole project for many years, and are always keen to get involved where ever and when ever we can. 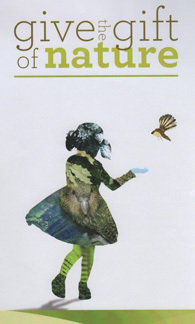 In the last month Toyota New Zealand began a conversation about the importance of connecting with nature, and entered into a relationship with DoC (the Department of Conservation). Click here to read about the celebration that Toyota NZ held to celebrate it's 50 years in New Zealand. Part of that celebration was the sending of a small Rimu seedling to every dealership in the country, for us to plant somewhere significant. We instantly thought of the Brook Sanctuary, and the opportunity to gift this seedling to the sanctuary. A conversation ensued and we sat down with Sanctuary Manager Hudson Dodd to discuss the opportunity to start something significant. As it transpired we couldn't gift the Rimu seedling to the Sanctuary as they have a strict bio-security blanket in place where only trees "born" in the sanctuary valley are able to go back into the valley. They have a very comprehensive seed raising operation in place, taking seeds from the trees in the sanctuary, raising them at the Sanctuary base by the dam, and replanting them as and where they need them. Instead we discussed their future plans for the area, how they envisaged the community engagement to be generated, and their collective wishes as to beginning places of commemoration within or just outside on the Sanctuary grounds. 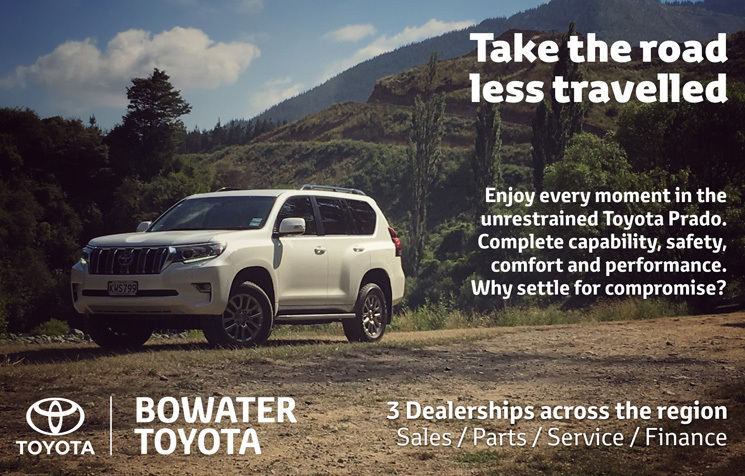 We saw the entire exercise as an opportunity to celebrate Toyota New Zealand's Believe Statements, which have become competely integrated into the Bowater Toyota "way". One of those statements is that by working together we can make a difference. So we listened. In the end we came up with a great plan that involved finding a perfect rock to inscribe a small part of our story in a way that would truly "stand the test of time". This video is long (14 minutes) but it celebrates our journey on Saturday 30th April when some of the Bowater Toyota team, and 3 generations of the Bowater family, came together and started something special. A tree was placed in the ground that will outlast us all, and will be a significant food source for birds long into the future as they repopulate the Brook Valley. It is awesome! Today was extra special for the team of Bowater Toyota at The Brook Waimarama Sanctuary Trust as a bunch got together with their kids and planted a tree to commemorate the long standing relationship between Bowaters and the Sanctuary. This tree will stand the test of time and be there to visit for generations to come, as well as provide nourishment for the birds as they repopulate the area. It's a long video but worth every second. Thank you everyone. It was a very special moment. There is of course so much more to the story. 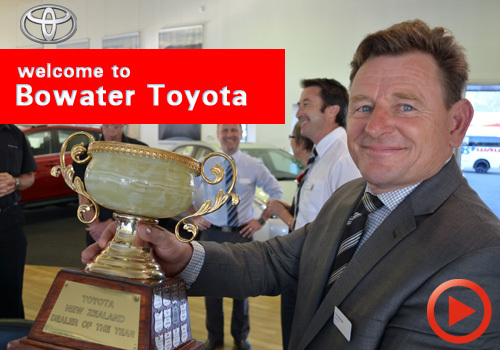 Bowater Toyota delighted to win 2015 Toyota Dealer of the Year. Tony Bowater (centre) on stage to collect the Dealer of the Year trophy for 2015. Click to enlarge. 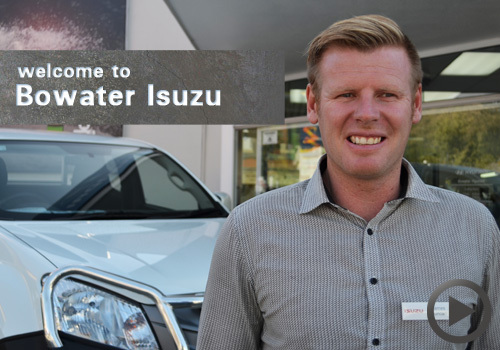 It has been a huge year for Bowater Toyota. 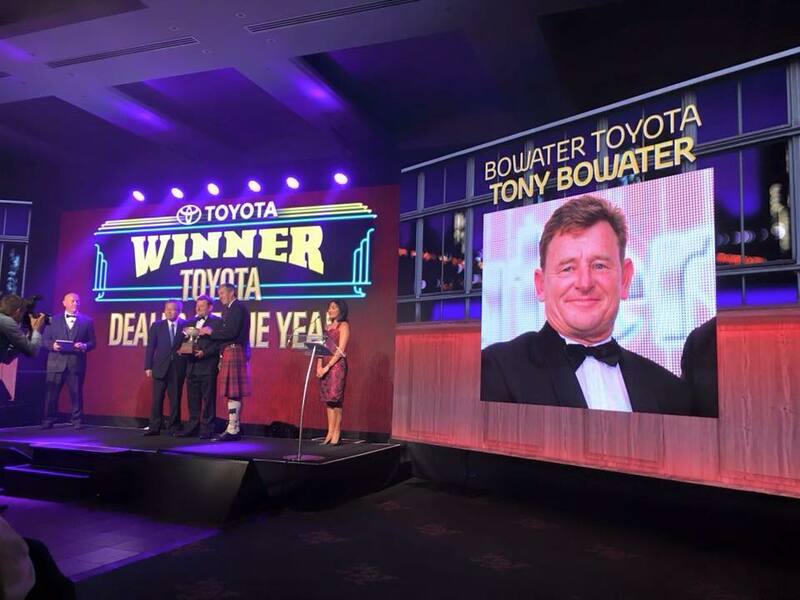 Imagine the surprise felt by all at the Bowater Toyota table when Tony Bowater got the call to stage as winner of the 2015 Toyota Dealer of the Year at the annual awards held on Friday 19th February in Nelson at the Rutherford Hotel. The surprise was justified. As reigning Dealer of the Year and current holders of the much coveted Yokoi Cup there was no expectation that the Bowater Toyota team COULD win it again, but there it was, on the big screen! Bowater Motor Group chairman Rodney Bowater and his wife Helen were lucky enough to be at the table as well, and could not help but be filled with pride. Imagine that. Toyota Dealer of the Year two years running, and awarded the prestigious title in our home town! Being the reigning trophy holders as last years Toyota Dealer Of the Year there came with it a hefty responsibility and an obligation to perform as champions. At our celebration dinner last year we heard from 3 time Adventure Racing World Champion Nathan Fa'avae on what it takes to carry the mantle of World Champion and convert that pride and excitement into a motivation to built on the successful practises that got you there in the first place, so that you could better your performance and remain at the top of your game. This attitude to success has certainly paid off in a big way. 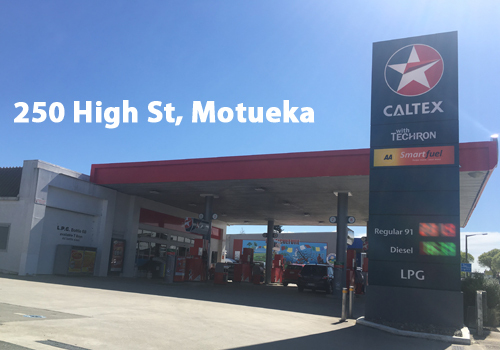 Tony Bowater was very proud of the team and humbled to receive this recognition on their behalf on Friday Feb 19th at the annual Toyota Dealer awards that were being held right here in Nelson. 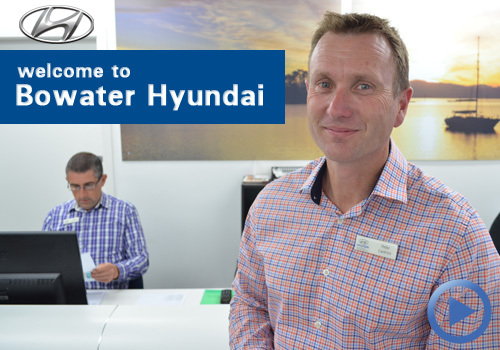 With the spotlight already shining on us, and being the reigning Toyota New Zealand Dealer of the Year, Tony went into the awards with no expectations, imagine the excitement of winning the ultimate award back to back! 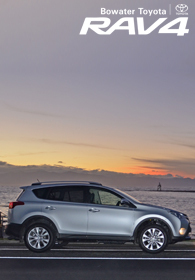 Bowater Hyundai head onto the sparkling seas of Tasman Bay to gain an experience of what changes lives. Peter Ransby. 1946 - 2015. 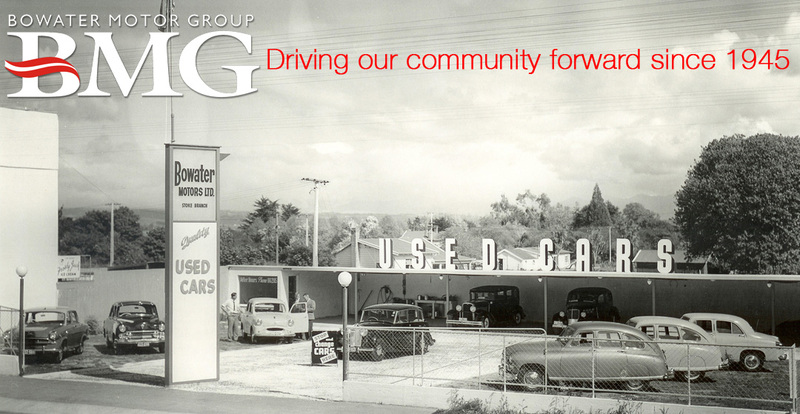 His legacy at the Bowater Motor Group.